Stuck at home today whilst an electrician did some work at home but I did manage to escape for a few hours and go back to Longham Lakes. The female Blue-winged Teal did show, but only briefly as it slipped from the long grass on the island into a hidden inlet. I hope to return as soon as the weather improves for better views. 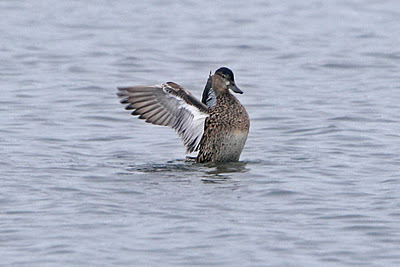 Blue-winged Teal is a vagrant from North America and is about the sixth record for Dorset. I have seen one previously in Dorset at Abbotsbury in 1999. With no photographs taken I have included (with permission) a shot from Vaughan Ashby taken of the same bird last week. Female Blue-winged Teal, Longham Lake. Photo by Vaughan Ashby / Birdfinders. I later made a brief visit to Hatch Pond where a Jack Snipe showed well for a few minutes in the recently cleared area adjacent to Elborn’s Cut.